As the United Kingdom comes to terms with the reality of the 300 year old Union remaining intact, the possibilities for all countries within the British Isles provide political commentators, analysts and those with a casual interest with an exciting prospect. David Cameron, on Friday morning, made a promise that may seem quite surreal. English votes for English laws, once and for all answering the West Lothian Question. The idea of not only Scots, but Irish, Welsh and English people voting for legislation that affects their respective nations alone is something I will certainly watch closely, and is bound to be a key policy at next year’s general election. So what has this got to do with setting the record straight on Nick Clegg? As many of you know, I have been a member of the Liberal Democrats since I could first vote back at the 2010 election and have sat back and watched the party in which I placed so much political faith, fall behind the likes of the far-right UKIP in the opinion polls; they have fallen victim to much scrutiny from the media and the UK electorate since they entered the coalition and most of it I feel, undeservedly so. As the British people and MPs begin to look ahead to May 2015, I want to explain the errors in understanding of the two biggest ‘downfalls’ in Nick Clegg’s short time as a cabinet minister, and why I sadly won’t be voting Liberal Democrat again. 2010’s hung parliament was a first for many living in the UK. For the first time in 36 years, the British electorate had failed to elect a party in majority to lead the House of Commons. Brown’s Labour had failed on the grounds of the economic crisis he and Tony Blair had failed to predict; Cameron’s Conservative’s proposed austerity measures seemed too hard to swallow; Clegg’s Democrats lost more seats than in any election, despite an apparent surge in public support that followed the first ever televised leaders’ debate. There were four options open to parliament, (there may have been five, but the idea of holding another election would have been pointlessly expensive and would have undoubtedly wielded the same result). A Labour minority government – this would have never had any support neither from the opposition or the electorate. Gordon Brown was already an unelected Prime Minister and as Brown had promised to resign from office, the prospect of a second unelected leader was inconceivable. Not only this, but the Idea of a party who came second behind the Conservatives in terms of parliamentary seats, seemingly being allowed to resume office was just not going to happen. Not to mention the practicalities; a minority Labour government would have faced heavy opposition from the greater-in-number Conservative Party, thus meaning passing any legislation based on Labour policy would have been near impossible. A Conservative minority government – A slightly more plausible outcome. However, had Cameron taken the Conservatives to Westminster alone, he would have faced the same issues a Labour minority would have. Together, Labour and the Liberal Democrats along with the other smaller parties would have outnumbered the Tories, meaning that any policies and legislation passed would have been fought immensely and probably rejected. A Liberal/Labour Coalition – any outcome involving Labour would have resulted in hostility. Once again, the prospect of the ‘losing’ party resuming office was something strongly rejected by the Liberal Democrats and ultimately informed the decision that followed negotiations between Labour and Clegg. In addition, the Conservatives would have outnumbered even a Lib/Lab coalition, and so the government would’ve faced an opposition so strong as to render the coalition useless. A Liberal/Conservative Coalition – the outcome that eventually came to pass. After talks failed between the Labour Party and the Liberal Democrats, Nick Clegg entered negotiations with David Cameron to find some common ground upon which they could build a legitimate government. With the two parties’ seats combined, they would have a majority in the House of Commons meaning that decisive action could be taken to begin the long road to economic and social recovery. Many see this as one of the main acts that condemned Nick Clegg’s standing as political leader, and perhaps as a politician overall. The common term used is that he ‘jumped into bed’ with the Tories for a taste of power, power his party had not seen since the early 20th Century. But let’s take a step back for a minute and look at what Clegg actually did. I’ve already outlined the possible outcomes of the 2010 hung parliament and even from my limited political analysis, it is blindingly obvious that the course of action taken was the right one. Clegg did not simply flutter to the party who offered him the best chance of power, it was a carefully considered and I suspect, difficult course of action to take. Clegg must’ve known that many of his manifesto’s pledges would have to bite the dust, but yet he decided to form a coalition with a party whose manifesto differed greatly from his own, in order to establish a majority government to swiftly respond to the issues that faced our great nation. What is considered by many as a vain act of political self-importance, was actually a brave and very politically aware decision that led to, yes hard times for most, but out of that a recovered economy, an increased tax threshold and a rejuvenated and stricter welfare system. Clegg’s coup de grâce. One of the biggest pledges in the Liberal Manifesto, the one that stirred the British youth to put down their video games and bottles of WKD and vote for the Lib Dems, was the promise not to raise tuition fees; probably with the intention of taking the Scottish line and abolishing them all together. Regardless of the fact that I strongly disagree with the abolition of university fees, the biggest blow to Clegg and the Lib Dems’ credibility is something that I find abhorrently misrepresented, misunderstood and ultimately, totally unfair. When Labour were in office, we knew the deficit was bad. When the Lib/Con Coalition took over, we found out it was £6billion worse than we’d originally been led to believe. The exiting Labour government had walked their dog, let it foul, and skipped away merrily leaving the incoming Coalition to clear up after them. Cameron and George Osbourne’s original austerity plans were quickly escalated to become a lot more serious and hard-hitting than the Tories had ever planned on. Money had to be saved from every avenue possible, affecting millions of people across the United Kingdom. People lost their jobs, businesses and livelihoods in the pursuit of fixing the catastrophic mess created by former Chancellor and Prime Minister, Gordon Brown. The UK is a lucky place when it comes to university, the Scots get it for free and England and Wales have a government funded student loans company who provide young people with the finances necessary to make it possible for millions to achieve their academic and professional aspirations. Obviously, this requires a lot of money. If we look to our neighbouring countries in Europe or even across the Atlantic in the US, students have to pay thousands out of their own or their parents’ pockets in order to study, so the original £3750 per year charged to students could be considered a bargain – especially when one considers the fact that none of the money has to be paid by the individual upfront. £3750 isn’t what it costs to put someone through university, it costs a significant amount more. The government foots the rest of the bill. In the search for money saving solutions, the Coalition turned to university funding. Clegg promised not to increase university fees, but the unspeakable mess of the economy meant that there wasn’t much room to negotiate. Short of closing some of the smaller, emerging universities (like the one I graduated from and currently study at), there was little option but to cut university funding and raise the financial cap on what universities were allowed to charge their students; my first point in defence of Clegg. My second point. The Coalition didn’t raise any fees! What they did was allow universities to charge students more to make up for the funding that had been withdrawn; the decision to charge the new maximum of £9000 lies solely with the universities that chose to do so. My third point is that at no point did the Coalition suspend, abolish or prevent the student loans company from lending new students the required amount for their tuition fees. All the students that took part in the ridiculously unjustified riots were all ill-informed and ill-educated (and I question their place at university in the first place), as they protested that the Coalition was stopping those people from poorer backgrounds from going to university. When last I checked, Student Finance England didn’t prejudice against those from poorer family backgrounds, in fact the only thing they do wrong is put you on hold for far too long and make the application process incredibly difficult. In fact the poorer your family, the more money they are willing to throw at you, so quite how the rioting students’ claims were substantiated is as big a mystery as the existence of God. My fourth point. With the raised cap on fees and the increased tuition fee loan amount, the government also changed the regulations on when one is expected to pay back the loan. Under the system that I went through, as soon as I begin to earn more than £15,000 per year, my loan repayments follow suit. The new system, in acknowledgment of the higher amount of debt, allows graduates to wait until they are earning more than £21,000 per year before they begin to make their loan repayments. Forgive me if I’m wrong, but that seems like a much better deal; let’s face it, a lot of people who go to university do so for the ‘experience’ and never get a job that pays a substantial amount and so these people are less likely to repay their loans of a higher amount, than those of my university generation who paid less for their Bachelor’s education. So let’s get this straight: tuition fees were raised by universities in order to keep themselves open because the government could no longer afford to fund them as much due to the fact the Labour government dive-bombed the economy, but they allowed students to borrow the amount required to pay the fees and raised the threshold at which they had to begin paying it back thus meaning that the exact same number of people who went to university in 2009 and 2010, could attend in the years following 2011. And the Coalition was scalded for this, why? 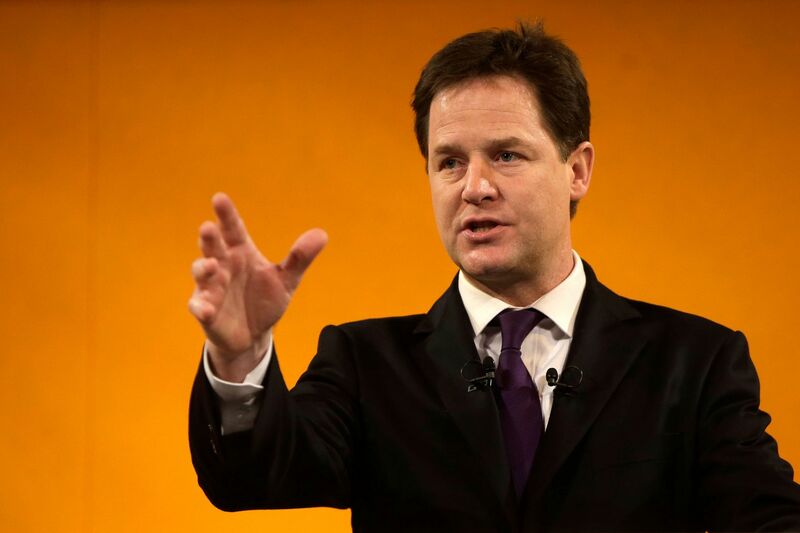 Yes, I appreciate Nick Clegg ‘reneged’ on a promise but for God’s sake, what was he meant do? People wanted an excuse to hate the Coalition because they felt cheated out of a proper government that they had elected. It was the public’s fault for being so indecisive and not electing a majority government, so we only have ourselves to blame. Sadly, Nick Clegg was the scapegoat for this misdirected anger and he hasn’t been trusted since. A few months later, Clegg felt obliged to apologise for the mistakes pinned on him by the public. He admitted it was wrong to allow universities to raise fees, and he said sorry. The first politician in history to apologise for a ‘bad’ decision and to admit they were ‘wrong’. A noble and honest gesture for which Clegg should be applauded, not chastised. The whole Coalition and tuition fee fiasco has cost Clegg and the Lib Dems their credibility and it makes me sad and angry. Sad because the Liberals have some good policies, but people’s ignorance and short-sightedness won’t allow them to be heard. Angry because the media and the public were so blinded by their ignorance that they didn’t bother to look into the reasons why such decisions were made, and the proper implications of the new policies and legislation. This piece has been a long time coming defence and clarifications of Nick Clegg’s early actions in government, so why will I not be voting Liberal Democrat in 2015? The answer may be as difficult for you to understand as it is for me to explain. The issue is Clegg. As leader, he is completely mistrusted and has lead the Lib Dems to fall behind the UK Independence Party in opinion polls, something which I am horrified by. If the Lib Dems were under different leadership, there may be a view of a rejuvenation of the party and people may give them a second chance; under the current leadership, I’m afraid this won’t happen. The Conservatives have performed what many thought would take a lot longer than a simple term in government. They have reversed the recession against all the odds, we have seen unemployment fall to its lowest level for years, they have made history by preventing the United Kingdom being split up by a fanatical Scottish Nationalist and they have taken diplomatic steps when confronted with difficult situations in Libya, Syria, Ukraine and Iraq. They have been a tough but effective government. As much as I am a Liberal at heart, I will do anything to prevent Ed Miliband and his red wearing goons from moving into Number 10. The only way to do this, is to secure another term with the Conservatives; we must not let all the hard work be undone. My only hope is that one day in the not too distant future, the Liberal Democrats find their leader that will inspire trust from the public and lead to a better, fairer and more liberal society in our glorious United Kingdom.